Not to be confused with Chrisom. Glass vessel containing chrism. The glass is etched with the letters SC for sanctum chrisma. Chrism, also called myrrh, myron, holy anointing oil, and consecrated oil, is a consecrated oil used in the Anglican, Armenian, Assyrian, Catholic and Old Catholic, Eastern and Oriental Orthodox, Mormon churches and Nordic Lutheran Churches in the administration of certain sacraments and ecclesiastical functions. The English chrism derives from Koine Greek via Latin and Old French. In Greek, khrîsma (χρῖσμα) was originally the verbal noun ("(the act of) anointing," "unction") of χρίειν ("anoint"). By extension, along with khrîma (χρῖμα), khrîstai (χρῖσται), and later khrísma (χρίσμα), it came to be used for the anointing oil or ointment itself. Khrísma came into Latin as chrisma, which appears in the works of Tertullian. This was adopted directly into Old English as crisma, which developed into Middle English crisme and various related spellings. In Old French, the original Latin was conflated with cramum ("cream"), developing into cresme, which was also borrowed into Middle English around 1300 as creme and various related spellings. The spelling chrism after the Latin original was generally adopted in the 16th century, after which "cream" came to be restricted to its present meaning. The Proto-Indo-European root from which the Greek term derived has been reconstructed as *ghrei- ("to trickle"). This is cognate with Sanskrit ghṛtə (घृत, from the radix घृ (भासे / क्षरणे / छादने), which means to shine / to trickle / to cover) and Hindi ghī (घी, "ghee"), as well as Lithuanian gr(i)ejù, griẽti ("skimming"), Middle Low German grēme ("grime"), Old English grīma ("mask, helm, spectre", presumably from an original sense of "covering" or "concealment"), English grime, and possibly Phrygian gegreimenan ("painted, ornamented, inscribed"). 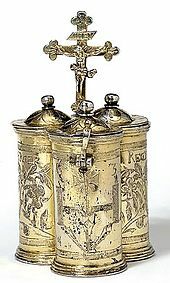 Chrismatory for ritual oil from Germany, 1636 (silver-gilt, Victoria and Albert Museum, London). Multiple early Christian documents discuss the "ordinance" or "several ceremonies...explained in the Apostolical Constitutions" of "chrism", including documents by Theophilus (d. 181) and Tertullian (d. 220). Stove and vessels for preparation of Chrism, 18th century (former Patriarchal residence, Moscow Kremlin). Stove for preparation of Chrism, detail. Chrism is essential for the Catholic Sacrament of Confirmation/Chrismation, and is prominently used in the sacraments of Baptism and Holy Orders. Those to be confirmed or chrismated, after receiving the laying on of hands, are anointed on the head by the bishop or priest. In baptism, if the person baptized is not to be immediately confirmed or chrismated, the minister anoints them with chrism. Newly ordained priests are anointed with chrism on the palms of their hands, and newly ordained bishops receive an anointing of chrism on their foreheads. It is also used in the consecration of objects such as churches and altars. Before the reforms of the Second Vatican Council, chrism had to be used to consecrate patens and chalices as well. The Sign of the Cross would be made with the chrism on the interior parts the chalice and paten where the Eucharist would rest; the Cross would then be smeared to cover the entire interior parts. The chalice and paten would need to be consecrated with the chrism again if they were re-gilded. This ritual could only be performed by a Bishop or a priest with the faculties to do so. According to the new rubrics, a simple blessing suffices. However, it is still permitted that the bishop performs the consecration with chrism. Chrism is made of olive oil and is scented with a sweet perfume, usually balsam. Under normal circumstances, chrism is consecrated by the bishop of the particular church in the presence of the presbyterium at the Chrism Mass, which takes place in the morning of Holy Thursday. The oil of catechumens and the oil of the sick are also blessed at this Mass. These holy oils are usually stored in special vessels known as chrismaria and kept in a cabinet known as an ambry. When the oils are distributed to a priest for him to use in his ministry they are kept in a smaller vessel with three compartments, known as an "oil stock". There is also a type of oil stock that is shaped like a ring, to make the anointing easier. The "jewel" of the ring is a container with a removable lid. The original Holy Ampulla in its relic receptacle before 1793. The Holy Ampulla or Holy Ampoule (Sainte Ampoule in French) was a glass vial which, from its first recorded use by Pope Innocent II for the anointing of Louis VII in 1131 to the coronation of Louis XVI in 1774, held the chrism or anointing oil for the coronations of the kings of France. Said to have been discovered by Hincmar the Archbishop of Reims when the sepulcher containing the body of Saint Remi was opened in the reign of Charles the Bald and identified with the baptism of Clovis I, the first Frankish king converted to Christianity; it was kept thereafter in the Abbey of Saint-Remi, Reims and brought with formality to the Cathedral of Notre-Dame, Reims at each coronation, where the emphasis was on the anointment rather than on the crowning. 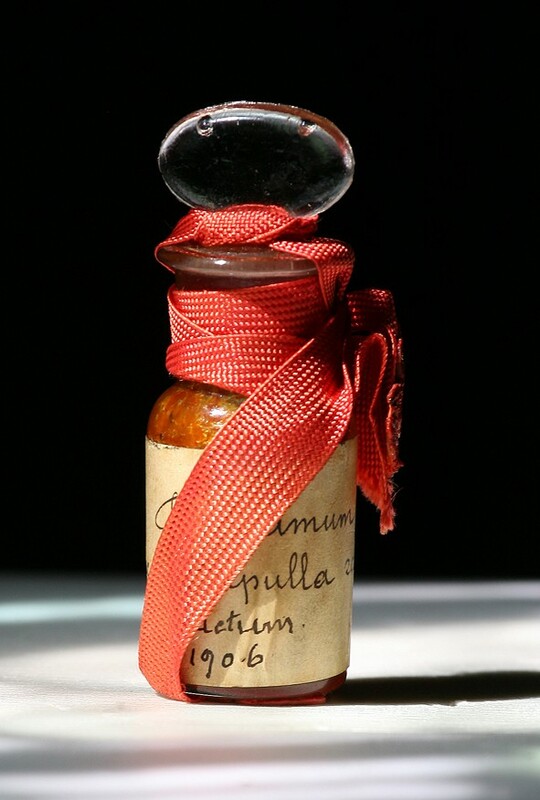 Some remains of the content of the ampoule, destroyed in 1793 by French revolutionaries, were placed in a new reliquary made in time for the coronation of Charles X and are kept since 1906 at the Archbishopric of Reims. The primary use of chrism in Anglican and Lutheran churches is for the Rite of Chrismation, which may be included as a part of Baptism, even for infants. 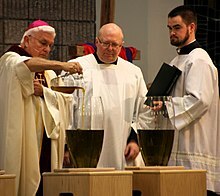 The oil of chrism is also commonly used in Confirmation, although this practice is not followed by churches of these denominations that are in the evangelical tradition. Owing to this difference of practice, it is common for Anglican and Lutheran confirmation liturgies to refer to the use of chrism as an option. The liturgy of the Church of England states "Oil mixed with fragrant spices (traditionally called chrism), expressing the blessings of the messianic era and the richness of the Holy Spirit, may be used to accompany the confirmation". The confirmation liturgy of the Anglican Province of Southern Africa includes the rubric "The Bishop may sign them on the forehead, using at his discretion the Chrism". The liturgy of the Igreja Lusitana (Anglican Church in Portugal) states at the point of confirmation: "Os confirmandos ajoelham perante o Bispo. Este pode assinala-los na testa com o sinal da cruz, usando oleo proprio" ("The confirmands kneel before the Bishop. He may sign them on the forehead with the sign of the cross, using the proper oil"). The use of chrism in Anglican and Lutheran ordination liturgies is similarly presented as an option in most provinces. In the liturgy for the ordination of priests in the Church of England, for example, the instruction is: "The bishop may anoint the palms of the hands of each newly ordained priest, saying 'May God, who anointed the Christ with the Holy Spirit at his baptism, anoint and empower you to reconcile and bless his people'." There is a similar instruction for the ordination of Bishops, although they are anointed on the head, rather than the palms of the hands. An important and specific use of chrism is in the Anointing during the Coronation of the British monarch. In this part of the Service, the Archbishop of Canterbury anoints the Sovereign on the head, hands and heart. This is considered to be the holiest rite of the Service, so much so that it is shielded from the congregation's view by a canopy of state. This is also why it was not filmed during the coronation of Queen Elizabeth II in 1953, nor was it photographed in 1937 during the coronation of King George VI and Queen Elizabeth. It occurs just prior to the presentation of the Crown Jewels to the Sovereign, which is in turn followed by the actual Coronation. Its other notable use is in the consecration of church buildings, where it may be used to anoint the walls, the altar/table, and the place for reservation of the Eucharistic sacrament for the sick. As in other traditions, chrism is usually olive oil (although other plant oils can be used in cases when olive oil is unavailable) and is scented with a sweet perfume, usually balsam. Under usual circumstances, chrism is consecrated by the bishop of the particular church in the presence of the presbyterium at the Chrism Eucharist, which takes place on Maundy Thursday or a day shortly before, where priestly ordination vows are often renewed also. The oil of catechumens and the oil of the sick are usually also consecrated at this liturgy. Practices vary for the blessing of the chrism, from interpolations within the Eucharistic Prayer, to specific prayers of consecration, used at the discretion of the minister. Some Lutheran and Anglican liturgical books, however, make provision for a pastor who is not a bishop (a presbyter) to consecrate chrism in time of need and in the absence of the bishop. Christians who are a part of the Latter-day Saint movement, who consider themselves restorationists, also practice ritual anointing of the sick, as well as other forms of anointing. Members of The Church of Jesus Christ of Latter-day Saints (Church of Jesus Christ) consider anointing to be an ordinance. 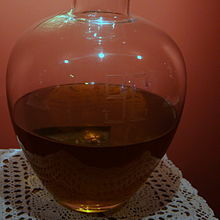 Members of the Church of Jesus Christ who hold the Melchizedek priesthood may use consecrated oil in performing the ordinance of blessing of the "sick or afflicted", though oil is not required if it is unavailable. The priesthood holder anoints the recipient's head with a drop of oil, then lays his hands upon that head and declares his act of anointing. Then another priesthood holder joins in, if available, and pronounces a "sealing" of the anointing and other words of blessing, as he feels inspired. Melchizedek priesthood holders are also authorized to consecrate any pure olive oil and often carry a personal supply in case they have need to perform a blessing. Oil is not used in other blessings, such as for people seeking comfort or counsel. The word "chrism" is not used. In addition to the James 5:14-15 reference, the Doctrine and Covenants contains numerous references to the anointing and healing of the sick by those with authority to do so. Chrismarium used in Russia before the revolution of 1917. The vessel is named "Alabaster" in reference to Matthew 26:7. Within the Eastern Catholic Churches, Oriental Orthodox and Eastern Orthodox, as well as in the Assyrian Church of the East, chrism plays a part in many liturgical services and sacraments. The first sacrament that uses chrism, the sacrament of Chrismation, is the second of the three Sacraments of Initiation (Baptism, Chrismation, and Divine Eucharist). For Eastern Christians, Chrismation canonically must be administered in conjunction with baptism, except in a case of true necessity. Here the blessing of the bishop upon the chrism functions as a substitute for the direct imposition of hands. Another use is in the consecration of church buildings, involving the anointing of the walls and of the altar table. Formerly, emperors and kings of monarchies where Orthodoxy was the state religion would receive anointment with chrism at their coronation. [...] into each vessel of new myrrh are poured a few drops of the old myrrh [...] This is done in token of the uninterrupted connection of the Russian Church with the Greek, from which she received [...] the first consecrated myrrh. On completion, chrism is distributed to all the bishops, who, in turn, give it to their parishes when needed. It is not made on a yearly basis, but only when supplies run short. The Eastern Orthodox Patriarchate of Constantinople produces chrism roughly once every 10 years using an ancient formula of the Jewish prophets and patriarchs that calls for 64 ingredients, while the flame needed to boil the mixture during the preparation is made by burning old and disfigured icons. The preparation of the Chrism in the Patriarchate is carried out by the college of the Kosmētores Myrepsoí (Greek: Κοσμήτορες Μυρεψοί, "Deans Perfumers"), presided by the Árchōn Myrepsós, the "Lord Perfumer". The incumbent[when?] Archon Myrepsos is biochemist Prodromos Thanasoglou. In Byzantine times the official responsible was the Grand Sacristan of the Patriarchate, but since then the specific office of the Archon Myrepsos was created. Laity are not allowed to handle either the chrism or the vessels containing it, therefore the Myrepsoi undergo a sort of "temporary ordination" into the clergy and are given by the Patriarch a gold "Cross of Ministry" to hang from their necks for the duration of their four-day service. The Archon is given the Lention, a silk "towel" or apron. Three copper cauldrons are used for the preparation: the largest contains olive oil, the smallest contains water and the aromatic ingredients and the middle contains wine, which allows the oil to boil without catching fire. The preparation involves several steps, some - such as the addition of musk and rose oil - performed by the Patriarch himself. Once the Chrism is filtered and ready, it is consecrated for the final time and stored in silver vessels in the Chapel of Saint Andrew, pending distribution. The Armenian Apostolic Church consecrates myrrh every seven years in autumn at Etchmiadzin Cathedral in Armenia. ^ a b c Oxford English Dictionary, 1st ed. "chrism, n." Oxford University Press (Oxford), 1889. ^ "Chrismatory". Metalwork. Victoria and Albert Museum. Retrieved 2007-08-18. ^ See Jean-Claude Bonne 2001, examining the coronation ordines from Charlemagne to Charles V, who commissioned a Livre du sacre, as C. Meredith Jones remarked, in reviewing Sir Francis Oppenheimer's monograph of the Holy Ampulla. ^ Common Worship - Christian Initiation, Church House Publishing 2006, ISBN 0-7151-2102-2, page 129. ^ An Anglican Prayer Book, Church of the Province of Southern Africa, Collins 1989, ISBN 0-00-599180-3, page 393. ^ Liturgia da Igreja Lusitana (Catolica Apostolica Evangelica), Igreja Lusitana 1991 (privately published), page 246. ^ Common Worship - Ordination Services, Church House Publishing 2007, ISBN 978-0-7151-2130-6, page 50. ^ Common Worship - Ordination Services, Church House Publishing 2007, ISBN 978-0-7151-2130-6, page 75. ^ a b "613 Administering to the Sick[permanent dead link]", LDS.org Gospel Topics. ^ "Priesthood Ordinances and Blessings". Family Guidebook. Salt Lake City, Utah: The Church of Jesus Christ of Latter-day Saints. February 2006. Retrieved 2009-09-21. ^ Sokolov, Dmitry Pavlovich (1899). A Manual of the Orthodox Church's Divine Services. New York: Wynkoop Hallenbeck Crawford Co. p. 103. Retrieved 2014-07-23. [...] into each vessel of new myrrh are poured a few drops of the old myrrh [...] This is done in token of the uninterrupted connection of the Russian Church with the Greek, from which she received [...] the first consecrated myrrh. ^ "The Sanctification of the Holy Chrism — Greek Orthodox Archdiocese of America". Retrieved 2009-09-19. ^ "Armenia: Myrrh Blessing". WelcomeArmenia.com. Retrieved 2015-09-26. ^ "Once-In-Seven-Years Experience". ArmeniaNow.com. 2015-09-25. Retrieved 2015-09-26. ^ Vassiliou, Tara (2012-04-03). "Muron' Olive Oil 1,700 Years in the Making". Olive Oil Times. Retrieved 2015-09-26. Wikimedia Commons has media related to Chrism. Chisholm, Hugh, ed. (1911). "Chrism" . Encyclopædia Britannica. 6 (11th ed.). Cambridge University Press. pp. 273–274.